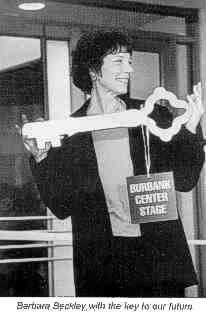 Twenty-five years to the month after our founding and seven full years after the beginning of our search for a larger theatre, our dream becomes a reality on April 27 as the City of Burbank handed us the keys to our new home. 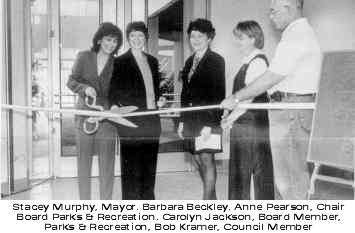 At a ribbon-cutting ceremony hosted by the City, Colony Producing Directory Barbara Beckley joined Burbank Mayor Stacey Murphy in cutting the ribbon, symbolically opening Burbank Center Stage, home of the Colony Theatre Company. The 14,000 square foot space, formerly a museum, was converted into a 276-seat theatre to be operated by the Colony, with shared use by Burbank community groups. As the ribbon was cut and the doors were opened, the invited guests, which included Burbank dignitaries, Colony members, volunteers, staff, and supporters, eagerly flowed inside to engage in the first public viewing of the nearly-finished theatre. There was a buzz of excitement in the air as the guests traveled from the lobby into the main auditorium, where they were dazzled by the sight of 276 new red velvet seats. From there, guests were able to wander to the areas which will soon be dressing rooms, backstage, control booth, and the gallery. Although the backstage areas were available for viewing by everyone, most chose to stay inthe main theatre, somehow transfixed in anticipation of the magic to come. After all of the delays and obstancles that we have had to overcome in the past year (construction began in January 1999), it finally feels as if we are coasting to the finish line. The contracts were unanimously approved by the Burbank City Council on March 28, officially cementing the partnership between us and the City. At the same meeting, the Council allocated an additional $150,000 in city funds to finish the project. That allocation of monies cleared the way for the final modifications needed to turn the space into a theatre. Known officially as "Phase One," those modifications include all physical elements, such as putting in the risers and the seats, constructing the stage, building the extra bathrooms, painting, carpeting, and erecting the walls. "Phase Two" of the project, which begins when the physical construction is finished, will be to outfit the building for use as a theatre. This includes installing all the theatrical lighting fixtures, outfitting the dressing rooms and offices, equipping the sound and light booth, putting up a marquee, and all the general improvements needed to operate a state of the art facility. The Colony is assuming the costs of "Phase Two" and has mounted a capital campaign to assist in covering these costs. This special campaign includes the opportunity to have your name permanently linked to the building in recognition of your contribution. Whether it's a local business naming our concession area or a subscriber dedicating a seat, there is an opportunity for everyone to become a part of our community and to take your place in Colony history. There is still much to do, but the goal is in sight. While it's easy to get caught up in the excitement of the new building and all it promises to be, there is still the task of moving out of our Riverside Drive location and moving into our Burbank home. May 8, 2000 was designated as "M-Day" at The Colony, marking the first day of the "May The Moving Month" for the Colony family. As the final production at our old space in Silver Lake closed on May 7, we began to clear our and move the following day. With rehearsals for our first production in Burbank slated to begin in June, the month of May is an "all hands on deck" moving extravaganza, where company members, associates, volunteers and staff are pitching in to help pack and move into the new theatre in Burbank. Like a family who's moving out of a house they've lived in for 25 years, we know it won't be easy to leave our nest, but considering all that we have to look forward to, we welcome the challange! Once we have moved into our new theatre, our focus will shift to mounting our first production, the Ray Bradbury musical Dandelion Wine, slated to open on August 26, 2000. Featuring brilliant music and lyrics by Jeffrey Rockwell, Dandelion Wine is a revival of one of the most beloved musicals in Colony history. A wonderful story about one perfect summer, it will warm your heart and make you feel young again. Returning to direct this historic production is The Colony's founding Artistic Director, Terrence Shank. Terrence established The Colony's reputation with landmark productions of The Royal Hunt of the Sun, Look Homeward, Angel, The Grapes of Wrath, two Ray Bradbury World Premieries, The Martian Chronicles and Fahrenheit 451, and our original 1981 production of Dandelion Wine. Since leaving The Colony in 1984, he has been directing professionally in Australia and South Africa, and for the past 10 years has been Artistic Director of the Mount Dora Theatre Company near Orlando, Florida. There is a certain symmetry in having Terrence return to direct our inaugural Burbank production, bringing full circle the creative traditions he helped to instill in our company 25 years ago. One week prior to the Opening Night of Dandelion Wine, The Colony is hosting a Black Tie Gala to celebrate the opening of our new theatre and to toast our 23-year relationshiop with author and playwright Ray Bradbury. We have been honored to have had a unique partnership with this literary icon and national treasure, as we have mounted four Bradbury productions over the years, including three world premiers:The Martian Chronicles, Fahrenheit 451, and The World of Ray Bradbury. We continue our Bradbury connection with our revival of Dandelion Wine, the heartwarming family musical which we first producted in 1981. We felt it appropriate that we use the celebration of our grand opening to honor the author who has been so generous to us over the years and was so instrumental to the early success of The Colony. Our world premiere in 1977 of The Martian Chronicles put The Colony on the map in a big way, and the rest, as they say, is history. Tickets to the Gala honoring Ray Bradbury, to be held on August 19, are available to the public and all proceeds from the event go directly to the theatre. Stay tuned for more information about this Grand Opening event! As you can see, there is much to do in the coming months, but we are ready for the challenges ahead. Dreams do come true, especially in the theatre! After 25 years of uninterrupted production, it seemed only fitting to have the final show at our home on Riverside Drive be Barbara Lebow's A Shayna Maidel. A haunting drama about two sisters who are reunited after the Holocaust. A Shayna Maidel seemed to be the quintessential Colony production: a story about family and the journey we all take to heal the emotional wounds that often distance us from those we need the most. It also seemed appropriate that our final production in Silver Lake was also one of the most acclaimed. A "Critics's Choice" in The Los Angeles Times, A Shayna Maidel was extended a full month beyond its original closing date, in order to accomodate everyone who wanted to see it. F. Kathleen Foley of the Times raved, "Lebow's drama about the reunion of two sisters separated by the Holocaust should be a perennial event. Finely crafted and emotionally hyper-charged, it offers the kind of rich and poignant characters that are a gift to actor and audience alike." T.H. McCulloh of ShowMag.com added, "A Shayna Maidel...is one of those rare masterpieces that has two sharp edges. Although it is superficially about the aftereffects of the Holocaust, it is at heart a story of a family torn apart, trying years later to blend its varying experiences and mend its deep wounds." A Shayna Maidel featured a stellar cast, led by Alison Shanks, who played Lusia, the haunted yet determined Holocaust survivor who comes to a new world only to face old demons. Denise Dillard played Lusia's Americanized sister Rose, who travels the furthest on her emotional journey toward understanding and acceptance of her family's past. Tim O'Hare commanded the stage as Lusia and Rose's father Mordechai, the stubborn and proud man who steadfastly insisted he did all he could do for his family, yet deep down bucked under the guilt of what his family had lost. Critic McCulloh commented on the other performances: "As Lusia's husband Duvid, who has also survived and arrives to help cement the family, Gregory S. Foran is a perfect match for Shanks' Lusia, with a gentle humor and rich detail. Both Ursula Martin and Stacey Silverman, in flashbacks as respectively Mordechai's wife and Lusia's childhood friend Hanna, give performances that help knit the threads of Lebow's tale into a tapestry that shines with humanity, humor and tenderness." With riveting performances and sensitive direction from Scott Segal, who also directed The Colony's productions of Morning Star and Incident at Vichy, A Shayna Maidel will long e remebered, not just as the show that closed out our tenure in Silver Lake, but as one of the most successful and critically acclaimed dramas in Colony history. The final Second Stage production at our residence on Riverside Drive was David's Mother, by Bob Randall. This affecting tale of a mother's devotion proved to be one of the most talked-about shows in recent history, as audience members took the time to write or call the theatre after seeing the show, just to tell us how much they had been moved by the production. The story of David, a developmentally disabled teenager, and his devoted mother, David's Mother peeks into the lives of the various people who are touched by David and his disability, from his mother to hisi sister, to his father, to his aunt, to the various father figures who come in and out of his world, even to the social worker whose job is to take David away from his mother. Even more vivid is the portrait of David's mother, Sally, played by Francesca Casale, as her self-sacrifice is so poignantly central to who she is and to how she relates to everyone around her. Directed by Tom Knickerbocker and Michael Wadler, David's Mother also featured a strong ensemble cast with J. Michael Wright as David, Lisa Beezley as Sally's sister, John Ross Clark as David's father, David Carey Foster as Sally's boyfriend, Tanya Little-Palmer as the social worker, Amy French as David's sister, and Hartley Haverty as David's cousin. Philip Brandes of The Los Angeles Times raved about David's Mother, "Posing a dilemma refreshingly free of hissy villains and unrealistic heroics, David's Mother finds compelling drama in the unglamorous challenges of real life." It may not have been glamorous, but David's Mother certainly won the hearts of our audiences. In all the excitement surrounding our impending move to Burbank and following closely on the heels of our two tremendously well-received productions, A Shayna Maidel and David's Mother, we are happy to say that our subscription family has grown to over 4,000 members! While we have been proud to boast the largest subscription base for any small theatre in Los Angeles for many years, our recent surge in membership is no doubt a signal that our decision to move to Burbank was the right one. To our many subscribers who have been with us and have supported us through the years and continue to encourage us and sustain us, we would like to say thank you. And to our new subscribers who have joined us for our new life in Burbank, we would like to welcome you to our family and we look forward to seeing all of you at the theatre! Our next production will be Ray Bradbury's Dandelion Wine, with music and lyrics by Jeffrey Rockwell. Several boys, ages 12-15, and one girl, a tomboy, age 14, are in the cast. If you know a child or young performer who has had some experience singing and dancing in school plays and would like to audition for this exciting show, please call the office at (818) 558-7000 (after May 22, 2000). Toni Sawyer (An Ideal Husband) appeared in the feature film The Sky is Falling.... Al D'Andrea (June Moon) was in recent episodes of NYPD Blue and Family Law and stars in a Discovery Channel Sunday morning series entitled The New Adventures of A.R.K. (Animal Rescue Kids)... Michelle Duffy (Our Country's Good) guest starred on an episode of Family Law, played Wendie Malick's daughter in the Lifetime movie Ann vs. Abby, starred as Maggie in the Milwaukee Repertory Theatre's production of Cat on a Hot Tin Roof, played Princess DeLong in Unsinkable Molly Brown starring Cathy Rigby in La Mirada, and won the 1999 Bay Area Drama Critics Circle Award for Best Lead Actress in a Musical for her performance in the TheatreWorks production of Sunday in the Park With George. Tom Knickerbocker (How To Succed in Business Without Really Trying) can be seen in a current Saturn commercial... Susan Savage (Mountains) stars in an Alleve commercial, currently running.... longtime member Richard LIneback has a supporting role in the current feature film Ready to Rumble, starring David Arquette and Oliver Platt.... Todd Nielsen (An Ideal Husband) is directing a World Premier production of Cool My Tongue at the Celebration Theatre this summer.... Robert Ryan (How To Sucdeed...) had a featured role in the new FX series Son of the Beach.... Maura Knowles (June Moon) shot episodes of Chicken Soup For the Soul, Becker, and a Murder, She Wrote move of the week, with Angela Lansbury. She was featured in a print ad for Saturn and filmed an industrial film for AskJeeves.com. Maura also perfomed in concert in Santa Barbara with Broadway star Karen Morrow. Stacey Scotte (An Ideal Husband) will be playing Mrs. Brandman opposite Kim Zimmer in a production of High Spirits at Theatrefest in Upper Montclair, New Jersey, this summer.... Marnie Andrews (Eleemosynary) recently directed a performance of Checkhov's The Marriage Proposal for the Classical Theatre Lab and wil be directing a performance of Trojan Women at the Getty Museum this summer.... Dink O'Neal (On The Twentieth Century) appeared in a featured role in the NBC Saturday morning sitcom City Guys and was featured in the premier episodes for three new series: Lords of the Mafia, Sworn Enemies and Arrest & Trial. Dink also performed in Cabrillo Music Theatre's production of The Pirates of Penzance, International City Theatre's production of 1940's Radio Hour and Santa Barbara Civil Light Opera's production of Man of La Mancha. Nick DeGruiccio (June Moon) is directing History of American Musical Theatre in 53 Minutes and 28 Seconds, a children's outreach show for the Music Theatre Guild which will be performed in schools and played Renfield in Dracula at the Pennsylvania Center Stage, and wil be playing Worthy in the Celebration Theatre's upcoming production of Cool My Tongue�. Chris Thomas (June Moon) performed in Gold Coast Plays production of Sweeney Todd, starring George Ball and Amanda McBroom�. Charles Howerton (An Ideal Husband) played Dogbrain in the animated short feature Wild Brain and was featured in voiceover and radio sports for Southwest Airlines. Premier Cruises and Forest Lawn and hosts the Internet comedy series, The Debunkers�. Alison Shanks (A Shayna Maidel) show an upcoming episode of M.Y.O.B., a midseason network replacement. Alison also shot an episode of Family Law and an independent film, Snacking, which was part of the New York Film and Video Festival�.. Chip Heller (An Ideal Husband) appeared on Jag, Chicago Hope, in a pilot for Michael Richards' new sitcom, stars in the comedy-horror flick sequel Jack Frost II and shot a national commercial for Puffs tissue. Jodi Carlisle (How to Succeed�) starred in a production of Noises Off! at the Long Beach Center Theatre. Jodi also recently co-starred on an episode of Providence and continues to star on Nickelodeon in The Wild Thornberries�. Darin Anthony (Shadow of a Gunman) was featured in the production of Cyrano De Bergerac, The Taming of the Shrew and Cymbeline, all at A Noise Within�. New company member Tom Dugan recently appeared on an episode of Party of Five and is featured in the feature films The Trial of Old Drum, opposite Scott Bakula, and Race to Space, opposite James Woods. Tom will also be touring his one man comedy show, Oscar To Oscar, this fall�. David Ruprecht continues to host the game show Supermarket Sweet on the PAX network�. D. Ewing Woodruff (How to Succeed�) recently completed a film called Bad Guys, with Michael Madsen�. And new member Donald Sage Mackay just finished the feature film Desert Saints, produced by Meg Ryan and starring Kiefer Sutherland. Donald will also be performing this summer as Cassio in Othello and as Rochefort (the lead villain) in The Three Musketeers at the Idaho Shakespeare Festival.